Unlike other gymnosperms such as conifers, cycads, and Gnetales, Ginkgo biloba is the only species of its genus that still thrive today - 2 million years after it first appeared. A gingko tree can live more than a millennia. Ancient Chinese Herbalism used cook gingko nuts, although on an intermittent basis, especially to support respiratory and bladder health. Modern herbalism and science studies utilize the two-lobed (bi-lobed) leaf of ginkgo as an adaptogen. Although the nuts, seeds and leaves of ginkgo are edible, the seeds are toxic to children, whereas the nut must be cooked before use. Also known as maidenhair tree, this ancient deciduous species now mostly cultivated not only in its native China and Japan but all over the world, both for its remedial properties and for its aesthetic look. Meanwhile, wild trees can only be found in two places in China; in Guizhou and in Tian Mu Shan Reserve, Zhejiang. Several studies have proven ginkgo trees adaptability and abilities to withstand infection from virus and bacteria, and pest attacks. The most extraordinary ability is its resistance to modern chemical; from pollution to nuclear exposure. Ginkgo trees in Hiroshima have not only survived the catastrophic blast, they did not suffer any deformity and are still alive till to this day, hence the reason for many medicinal interests and clinical studies. 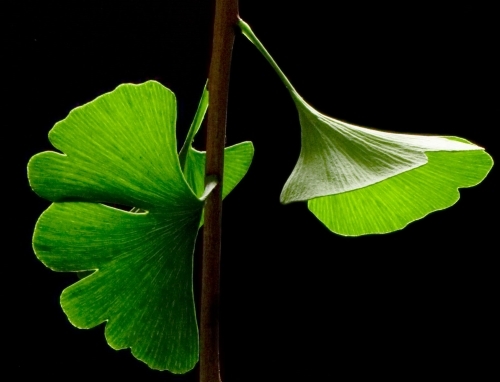 The prized part of ginkgo in Modern Herbalism is the leaves where many beneficial constituents are believed to be present, mainly the anti-oxidants. They have been proven to increase oxygen supply to the brain, thus improve brain function, reduce stress, preserve and sharpen memory, concentration and alertness. One of the anti-oxidant also possesses antibacterial, antifungal, astringent and anthelmintic properties. The chemical constituents in Ginkgo biloba can interact with other herbs or medication and has been seen to reduce the potency of anticonvulsants and may trigger seizures to epileptic sufferers. Ginkgo reacts positively or negatively with antidepressants, depending on the medication. Do not take any form of ginkgo if scheduled for surgery. Pregnant and breastfeeding women should not take ginkgo.